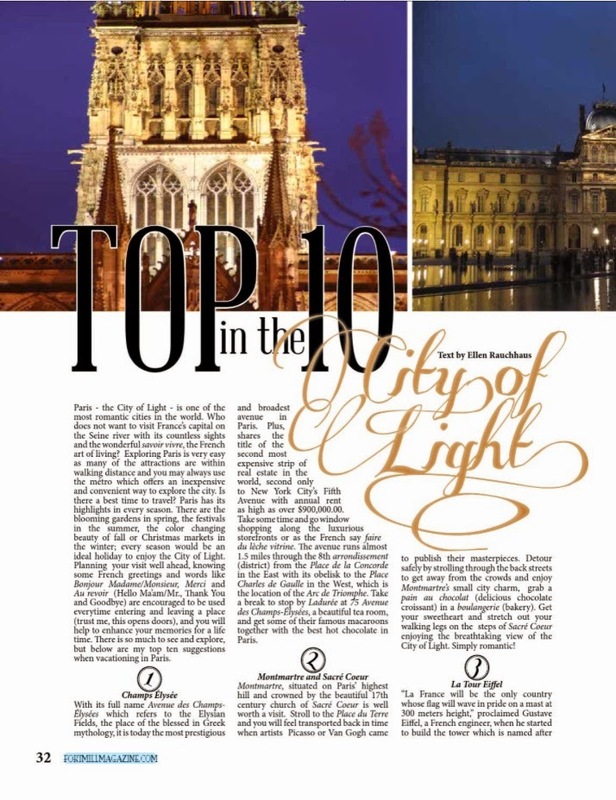 European Delights by TripDesign: Ellen's article in the Fort Mill Magazine Spring 2014 issue: Bienvenue a Paris! 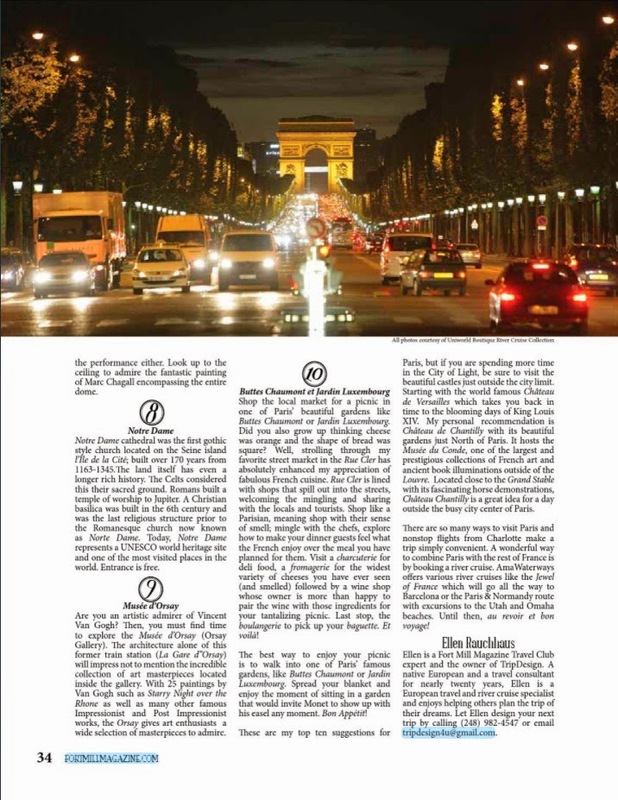 Ellen's article in the Fort Mill Magazine Spring 2014 issue: Bienvenue a Paris! Top ten things to see and do while visiting the City of Light. Paris - the City of Light - and one of the most romantic cities in the world. Who does not want to visit France’s capital on the Seine river with its countless sights and the wonderful savoir vivre, the French art of living? Exploring Paris is very easy as many of the attractions are within walking distance and you may always use the “Métro” which offers an inexpensive and convenient way to explore the city. Is there a best time to travel? Paris has its highlights in every season. There are the blooming gardens in Spring, the festivals in the Summer, the color changing beauty of Fall or Christmas markets in the Winter; every season would be an ideal holiday to enjoy the City of Light. Planning your visit well ahead, knowing some French greetings and words like “Bonjour, Madame/ Monsieur” , “Merci” and “Au revoir” (Hello Ma’am/Mr., Thank You and Goodbye) are encouraged to be used every time entering and leaving a place (trust me, this opens doors), and you will help to enhance your memories for a life time. There is so much to see and explore, but below are my top ten suggestions when vacationing in Paris. With its full name “Avenue des Champs-Élysées” which refers to the Elysian Fields, the place of the blessed in Greek mythology, it is today the most prestigious and broadest avenue in Paris. Plus, shares the title of the second most expensive strip of real estate in the world, second only to New York City’s Fifth Avenue with the annual rent being as high as over $900.000.00! Take some time and go window shopping the luxurious stores or as the French say “faire du lèche-vitrine” . The avenue runs almost 1.5 miles through the 8th arrondissement (district) form the “Place de la Concorde” in the East with its obelisk to the “Place Charles de Gaulle” in the West, which is the location of the Eiffel Tower or “Arc de Triomphe”. Take a break to stop by “Ladurée” (75 Avenue des Champs-Élysées), a beautiful tea room, and get some of their famous macaroons together with the best hot chocolate in Paris! “Montmartre”, situated on Paris’ highest hill and crowned by the beautiful 17th century church of “Sacré Coeur” is well worth a visit. Stroll to the “Place du Terre” and almost feel like being rushed back in time when artists “Picasso” or “Van Gogh” came to publish their masterpieces. Detour safely by strolling through the back streets to get away from the tourist’s crowd and enjoy Montmartre’s small city charm, grab a “pain au chocolat” (delicious chocolate croissant) in a “boulangerie” (bakery), get your sweetheart and stretch out your walking legs on the steps of “Sacré Coeur” enjoying the breathtaking view of the City of Light. How simply romantic! These were the words “Gustave Eiffel”, a French engineer, used when he started to build the tower which is named after him. We know this is not true anymore, but being in Paris this massive monument out of steel and masterpiece of engineering is well worth a visit. Before your tour please make reservations way in advance to avoid a long wait in line for tickets. If you would like to do some workout, climb the stairs to the second platform and treat yourself with a lunch at the restaurant “Jules Verne” which is also located here. Originally built for the 100th anniversary of the French Revolution, “La Tour Eiffel” , which is its French name, had been built for the world exhibit in Paris which took place in 1889 and was only supposed to be present for a couple of months. Now, Paris would not be Paris without its Eiffel tower, right? One insider tip for what I think an even more beautiful view if you forgot to make reservations and don’t want to spend the time in line waiting to get up: Head to the “Arc de Triomphe” and go up. 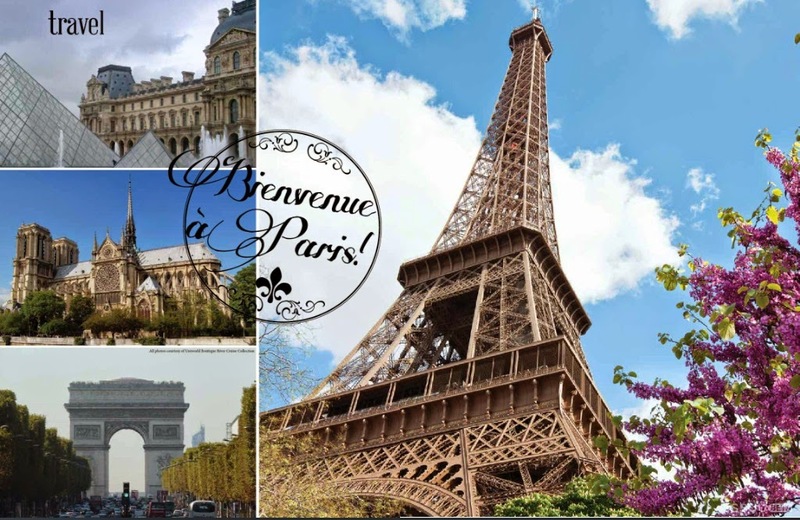 A breathtaking view with the star shaped boulevards at your feet towards the Eiffel Tower. There is also a museum where you can learn why Napoleon gave order to build this monument. For some it might not be of interest to visit a cemetery during your vacation but visiting Paris’ “Pere Lachaise cimetière” is like visiting the RIP - VIPs ! Jim Morrison, Edith Piaf and Oscar Wilde just to name a few. Soak up the quiet, watch the trees, smell the flowers, listen to the birds. Grab a map and check out the tombs of your favorite RIP - VIPs. Put on your Sunday best and head over to “St. Germain-des-Prés” which lines the left bank of the Seine and extends southwards to the sprawling “Jardin de Luxembourg”. It is one of the more upscale neighborhoods in Paris where you’ll find locals outfitted in Louis Vuitton and Dior on their way to a business meeting or out for a stroll on “Boulevard St.-Germain”. It is also an artistic hub and in the past a spot for existentialist thinkers like “Jean-Paul Sartre”. This is the place to see and be seen. A great way to explore the neighborhood is by booking a patisserie and chocolate tasting tour! Head to the “Église Saint Germain” , Paris’ oldest church dating back to the 6th century. Stroll through the small alleyways next to the church. You will find a wonderful assembly of fine bars, restaurants and “brasseries” where you will experience a great time with locals. Enjoy a cafe-au-lait at “Les deux Magots” where Hemingway was a frequent customer. My favorite wine bar is “L’âne et la mule” (14 Rue Guisarde), excellent wine selection, delicious food and wonderful loving local people. Once the biggest building in the world and the palace of the ultimate kings the Louvre was built in stages over 8 centuries. With its striking 20th century pyramide used as the entrance, the Louvre now houses the world’s greatest collection of art treasures from prehistory to about 1850. If you plan on visiting the Louvre during your stay in Paris, plan well ahead to maximize your time! You will not be able to see the whole collection in one day. To avoid waiting times which can add to a couple of hours, buy a city museum pass in advance that will grant you entry to all the museums. With this pass you can walk right through the entrance and you will be able to see Mona Lisa and Co in no time. The “Palais Garnier” counts as one of the most beautiful opera houses in the world. The Garnier is named after its architect “Charles Garnier” and since the completion of the “Opera Bastille” it is mostly being used for ballet performances. Did you know that this is the original showplace of “Gaston Leroux’s” legendary “Phantom of the Opera”? The subterraneous waters, which he rows with his boat, really exist and still need to be pumped on a regular basis. Completed in 1875 at a time where seen and to be seen was an inherent part of each visit to an opera, Garnier showed respect to that matter in adding a spectacular marble staircase into the foyer of the palais. Also the auditorium was built in a u-shape, which did not guarantee an optimal view from the 1900 velvet draped seats to the stage. But a perfect view to the loge vis-à-vis! The lights of the almost 18000 pound heavy chandelier did not turn off during the performance either. Look up to the ceiling to admire the fantastic painting of “Marc Chagall” encompassing the entire dome. “Notre Dame” cathedral was the first gothic style church located on the Seine island “ l’Île de la Cité”; built over 170 years from 1163-1345. The land itself, has even a longer rich history. The Celts considered this their sacred ground. Romans built a temple of worship to Jupiter, a Christian basilica was built in the 6th century and was the last religious structure prior to the Romanesque church now known as “Norte Dame”. Today, “Notre Dame” represents a UNESCO world heritage site and one of the most visited places in the world. Entrance is free! Are you an artistic admirer of “Vincent Van Gogh”? Then you must find time to explore the Orsay Gallery or “Musée d’Orsay”. The architecture alone of this former train station (La Gare d”Orsay) will impress not to mention the incredible collection of art masterpieces located inside the gallery. With 25 paintings by “Van Gogh”, such as “Starry Night over the Rhone” as well as many other famous Impressionist and Post Impressionist works, the Orsay gives art enthusiasts a wide selection of masterpieces to admire. Did you also grow up thinking cheese was orange and the shape of the bread was square? Well, strolling through my favorite street market in the “Rue Cler” has absolutely enhanced my appreciation of fabulous French cuisine. “Rue Cler “ is lined with shops that spill out into the streets, welcoming the mingling and sharing with the locals and tourists. Shop like a Parisian, meaning shop with their sense of smell; mingle with the chefs, explore how to make your dinner guests feel what the French enjoy over the meal you have planned for them. Visit a “charcuterie” for deli food, a “fromagerie” for the widest variety of cheeses you have ever seen (and smelled) followed by a wine shop whose owner is more than happy to pair the wine with those ingredients you’ve selected for your tantalizing picnic. Last stop: the “boulangerie” to pick up your baguette. Et voilà! The best way to enjoy your picnic is to walk into one of Paris’ famous gardens, like Buttes Chaumont or Jardin Luxembourg. Spread your blanket and enjoy the moment of sitting in a garden surrounding that would invite Monet to show up with his easel any minute! Bon Appétit! These are my top ten suggestions for Paris but if you are spending more time in the City of Lights, don’t miss out to visit the beautiful castles just outside the city limit. Starting with the world famous “Château de Versailles” which takes you back in time to the blooming days of King Louis XIV. My personal recommendation: “Château de Chantilly” with its beautiful gardens just North of Paris. It hosts the “Musée du Conde”, one of the largest and prestigious collections of French art and ancient book illuminations outside of the Louvre. Located close to the “Grand Stable” with its fascinating horse demonstrations, “Château Chantilly” is a great idea for a day outside the busy city center of Paris. There are so many ways to visit Paris and nonstop flights from Charlotte make a trip simply convenient. A wonderful way to combine Paris with the rest of France is by booking a river cruise. AmaWaterways offers various river cruises like the “Jewel of France” which will go all the way to Barcelona or the “Paris & Normandy” route with excursions to the Utah and Omaha beaches. Until then: Au revoir et bon voyage! Ellen Rauchhaus is a Fort Mill Magazine Travel Club expert and the owner of TripDesign. A native European and a travel consultant for nearly twenty years, Ellen is a Europe travel and river cruise specialist and enjoys helping others plan the trip of their dreams. Let Ellen design your next trip by calling (248) 982-4547 or email tripdesign4u@gmail.com.